day and night, for us to adore him. This weekend we begin asking folks to sign up. The sign-up sheets are in the front vestibule. but you can exit out the sacristy door. It’s essential we have, at minimum, two adorers for every hour. maybe consider taking those off hours? Let’s talk about what 40 Hours is – and why we do it. The first and best form of adoring the Lord is the Holy Mass. while he is on the Cross, suffering and dying for our salvation. in which our Lord offers himself in an “unbloody” manner. on Sundays and holy days of obligation is a grave duty for us. So where does Exposition of the Eucharist fit in? the believers spent with the Lord. beneath the sign of bread or wine. And that requires, of course, an act of faith. just as curls build our biceps. you will be able to meet the President, and visit with him? Pretty slim. Same with the pope, or a famous athlete, or movie star. for as long as we want! Now, someone might say, but God is everywhere, right? I can talk to God in my car, at home, in the woods. for God to have come to earth and become a human being. Why was that important to do? Jesus didn’t need the Cross to forgive us. He could have done it without the Cross. So why do all that? Someone can send you a note; or that same person can come and visit. Is there a difference? Of course there is. our Lord doesn’t just give us words; he gives himself. And then at the altar, to be our Food? He becomes part of us? We can touch and taste? about the importance of adoring the Eucharist. When we come to adoration, we are recognizing him as our king. we bend the knees of our hearts. and when I saw the tabernacle, I genuflected. so as not to make things awkward. And I’ve probably done that at some point as well. It’s important we tell ourselves that; and that we tell others. is because we have lots of children. I love having children at Mass. but keep bringing them, please! And I encourage you to bring your children to Forty Hours. teach them how to talk to Jesus on the altar. Even a short visit is priceless. by writing something, or drawing something. if your children talk to Jesus out loud. It’s really fine! It’s actually wonderful. Don’t let it bother you. As they grow older, they’ll learn the skills they need. and that we can come to him. No matter who we are. All this has just come to completion, at an expense of about $52,000. We actually got more than that in value, as many items were donated, including a lot of paint, carpeting, and labor. This weekend I'm welcoming folks into my house to see it all. Tonight is a "Sneak Peek" for those who helped bring it together; Sunday is an Open House for everyone (1-3 pm); Tuesday I'll invite the Mass-goers over. So after a spate of last-minute things this week, today I typed up a summary sheet of all the aspects of the project, and drove down to Troy to have it blown up into a poster; I'll put that up on Sunday for the benefit of the visitors, along with a stack of envelopes (hint, hint!). But tonight, no pitch for help, even a soft one; I wouldn't even ask anyone to bring things. Instead, I arranged for some food trays from Buschers, and I picked up some snacks at the store. I just got back a bit ago, and got everything in the fridge that needs to chill. In a bit I'll go get the trays, as well as some ice. So, sorry I haven't been posting, but now you know one reason why. With everything all spiffed up, I may even post some pictures! Who are the workers the Lord is sending into his vineyard? These people he goes out, hour after hour, to find? What is the work? The Lord has one purpose: to save humanity. Yet he chooses to enlist us as his collaborators. This is how he created us. Then he gives humanity, male and female, dominion over the earth. in bringing new human beings into existence! Likewise, our baptism is about our sharing in Christ’s work. We became part of Christ in baptism; we are part of his mission. We share in his dying and rising. We embrace the Cross. We share in the work of salvation, and our hope is the resurrection. You pay me a salary as your priest. Plus you provide me a home, and groceries. That plus my paycheck takes care of all my needs. Thank you! Likewise, God provides our needs. Yes, we have to work for it. I have the privilege of working for the Lord, working for your salvation. Most of us have other bosses. or to talk about our Lord or to invite people to share our Faith. because every good thing in this world comes from him. Look beyond the paycheck you receive. Did your family come from your employer? Did your company give you your parents? Your health? Your talents? And of course, the greatest “pay” we receive is Christ himself! or arriving at the last, will be paid the same. But there is a larger question. are we giving him value for his wages? that is your section of the vineyard. you are helping to populate heaven! In all these things, again, we are carrying out the Lord’s task. What else is part of our work in the vineyard? I submit that prayer is part of our task. but above all, devoting prayer to the needs of others. and for people who wander away from the Faith. And, of course, there’s lots of discussion: what do we do about it? But there’s no secret formula for this. We are workers in the vineyard. Are we working? That is, are we working for the Lord—the Master of the Vineyard? If we are praying. If we are living our Faith. If we are sharing our Faith with others, especially our family. If we are practicing what we profess. If we are serious about growing in holiness. If we go regularly to confession. Then that’s evangelization, whether you call it old or new. and started a church around here. Maybe we would laugh it off. Then maybe we’d get irritated. Maybe we’d bad-mouth them. Or maybe we’d look for some excuse or explanation. if Sunday Mass looked more like what these other folks do. “How about we get serious about our Catholic Faith? Let’s get fired up! We can check in with people personally. Of course, who says we have to wait to do any of these things? where some of our folks already have gravitated. Drawing others to Christ is our task. We are the Lord’s workers; he pays us very well. to this Feast of the Exultation of the Holy Cross. who in AD 312 was embroiled in a civil war to see who would rule Rome. and he had his soldiers trace that sign on their shields. which looks to our eyes like an X on top of a P.
It’s on our tabernacle right there. to practice their faith without interference. in search of the True Cross. and in those days, travel was very difficult, even for royalty. at the site of Calvary and the tomb were temples to Venus and Jupiter. The pagan Romans had built these almost 200 years before. she had the pagan shrines torn down, and began digging. She found three crosses! Was one of them the Cross of Christ? and touched her with each cross. After the third cross touched her, she began to recover. before the people for the first time since the day our Lord died on it. where it is on display to this day. Is it real? I think it is. and then taken any old thing someone pushed at her. which he won after trusting in the sign of the Cross. But our faith doesn’t depend on this particular story. What’s important is that the Cross happened. Jesus lived, was arrested, was crucified, died and was buried. And the tomb was found empty on the third day. These are the facts on which our Faith rests. Meanwhile, the truth of the Cross is unassailable. is the same as it was. We still cannot save ourselves. and expand our waistlines, but they don’t bring us peace. but for the same reasons, and with the same results. of the Great War to end all wars. How’d that turn out? Thirteen years ago last week, terror struck our country. Are we any closer today to escaping the threat? Moses lifted up that strange sign, yet it gave life. God lifting up a broken man, his son, on the cross, lifted before the world. Even so: the Cross is the only hope the world has. And there are powerful signs of the Cross at work in our world. he was led to realize: Jesus is the Savior of the world! his father fell and he was able to escape. He became a Catholic; he is still in India, where he tells his story. even though they won’t talk to him. There are other stories of conversion. even with the terrible persecutions they and we are witnessing. Which may explain the ferocity of the persecution, don’t you think? they see genuine love and generosity, as well as moral lifestyles. and marriages that were true partnerships. Something for us to think about in how we live our lives! or when they prayed to Christ themselves. Third, they were not happy with their experience of Islam. they received dreams and visions, pointing them toward Christ. but because of the power of the Cross? You and I may not meet many Muslims. But we do meet people who need Christ in the center of their lives. What do they see in us? What did our Lord say? Today the Church honors the Holy Name of Mary. As I described to the faithful at Holy Mass this morning, there is an interesting history to this observance. Before heading to the battle, Sobieski brought his army to Czestochowa, Poland, to the monastery of Jasna Gora, where the image of the Black Madonna was housed. As they marched to war, they sang the Polish national anthem, which was a hymn to our Lady. The Turks, despite vastly outnumbering Sobieski's forces, eventually withdrew; in doing so, they left behind many of their stores of food. Among the items the jubilant Viennese discovered was coffee! And so, to mark the victory, Viennese bakers created pastries in the shape of the crescents they saw on the Turkish banners: we know them by their French name, "croissant." Perhaps they drank the Turks' coffee with them? While the story of the croissant may be apochryphal, it is certain that Pope Innocent XI gave thanks to our Lady for her intervention by establishing this feast in her honor. Pope Pius X established it on this date, which is the anniversary of the battle. After the Second Vatican Council, the feast was dropped from the calendar. But in 2002, the most famous son of Poland, Pope John Paul II, restored it to the Roman Calendar. And so, after Holy Mass, the parish's new youth director and I drove down to Troy to eat croissants and drink coffee! But we didn't get the Turkish kind, which is no great loss, to be honest. But that's another story. Our Lady of Victory! Pray for us! In the last week, I've gotten a TV and audio set up for the rectory; and today, the Internet access point was installed; so now, I've got Pandora on my TV, and I'm listening to Frank Sinatra, Ray Charles, and other good stuff. Meanwhile, I'm surfing the Internet, and I see this headline on Instapundit: Stop Dressing Like A Slob When Traveling. And I remember: people used to dress up to fly. And for church. 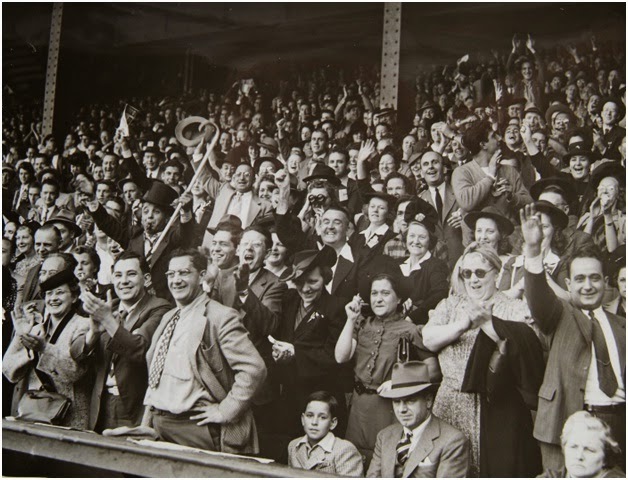 And heck, they used to dress nicely for baseball games! Don't believe it? Go find the movie, "Pride of the Yankees," or the "Babe Ruth Story," Heck, any movie from before 1960: you'll see that people dressed up better for everything. Earlier this week, I had a funeral. And a young man was there, with a buttoned shirt -- open -- showing his tshirt. At a funeral! He couldn't at least button his shirt? Are you kidding me? At a funeral? What's happened to our culture? As I was saying...wherever you look, can you find any example where our culture is better, more refined, more beautiful, than, say, in 1960? 1970? I know what you're thinking: oh, that is what happens when you pass a certain age; you start getting grumpy about the current stuff, and then before you know it, you're watching Lawrence Welk re-runs. OK, could be. So if you're reading this, and you're under 30, please, please post a comment here. Do you think our current culture beats what my parents had? (FYI, I was born in 1962; my experience of contemporaneous culture has been a steady downward trend.) Do you think the culture you grew up with is something better than I do? Please let us know. Do I sound angry? I'm not angry. I'm listening to Louis Armstrong, Dean Martin and Ella Fitzgerald. I have a great inheritance that is available to me. I think of the classical education I received, and the doors that opened for me. All that is mine, and it's not endangered...for me. But I'm sad. I'm sad to think of people who dress like slobs at the funerals of someone they love, not because they are contemptuous, but because they simply don't know any better. They speak in fragments, peppered with vulgarities and obscenities for the same reason -- because they don't know any better. They gape at cathedrals, and wonder what they are; they see a Latin inscription, and just stare. They watch an American movie from the 1940s, and wonder, what world is that? The readings are all about calling people to conversion. The “watchman” in the first reading. The method of providing correction in the Gospel. to hear that call to conversion. Saint Paul reminds us of the commandments. As the “watchman” appointed for Russia, I will do the same. all the commandments remain in full force! Is that all there is to calling us to conversion? I remind you? The truth is, conversion is often painful. giving it up is going to be really hard. and how weak we are. what whiny-babies we can be about some things. That’s changing ourselves. That’s hard enough. Then there’s confronting others. That’s even harder. The process described in the Gospel is hard to get just right. and we’re watching, from the sidelines, cringing. It doesn’t work; it really makes things worse. But we know; we saw the whole thing. some speaking up…they don’t do a thing. The balance is so hard. So what, do you think I just gave us all permission to ignore this? Not at all. I’m just reiterating my point: conversion is hard. what she’d be like in heaven. or others, carrying on with our habits and preferences in heaven. but is that really what heaven is? More of the same as here? Does that even sound like heaven to you? Do you really want an eternity of that? it’s not something we can just skip. It reminds me of when I was in high school. and I’d have a pile of homework to do. and it was still there when I went to bed Friday night. Still there Saturday morning. And night. And after Sunday Mass. Still there when Sunday night came. The job didn’t become easier by avoiding it. And Monday morning was judgment day. Well, thankfully, there’s more to heaven than high school! All right, I’ve stated the problem. What do we do with it? Here are some suggestions. First, don’t dodge it, admit it: we need conversion. As far as what may need to change? We’re all different. I have sins I confess over and over, and you might say the same. Second, talk to the Lord about what you’re going to tackle. Is it more prayer, or more serious prayer, in your life? Is it overcoming a sinful habit? Is it being more truly generous? Correcting a fault? Your resolution is up to you. Third, make a plan. It can be a really simple plan. Start somewhere, even if it’s small. Be practical. If you use bad language, how about a “swear jar”? you put a quarter, or a dollar, in the jar. Then you give the money away! Ouch! Is the Internet causing you problems? Put your computer in a public place. When someone moves his or her computer to the living room? is we make it hard for each other. Let’s help each other in gracious ways. Fourth. Go to confession. Can’t leave that out. I am embarrassed sometimes when I go to confession. Just go. Fifth. Accept that you will have to give up something. Or take on something hard. One way or the other, there will be sacrifice. it’s not going to be the same for everyone. One person can have a few drinks, but stop at the right time. Another person, can’t even have the one. It doesn’t seem fair. Don’t compare yourself to others. was benching 400 pounds. Yeow! You’re embarrassed, you can barely manage 200. Then the guy after you? He moves the weight down to 50! is shedding bad habits, and embracing a more challenging spiritual life. or giving permission for someone treating us badly. we become better, stronger, fuller people. More truly alive in the Holy Spirit. It’s not about how we become better doormats. ran out our credit with God. None of that is true. which will change God’s love for us. He never gives up on us! but because they gave up—or weren’t willing to try. and we have confession, and we can go, back, and back and back? This is why. There’s a light on for us—and it’s always on. I agree with Victoria Osteen! "So, I want you to know this morning: Just do good for your own self. Do good because God wants you to be happy," she continued. "When you come to church, when you worship Him, you're not doing it for God really. You're doing it for yourself, because that's what makes God happy. Amen?" If you click on the paragraph above, you'll go to one article about it, and a video as well. While it sounds terrible, part of what she says is correct. That is, the second part, about worship. Our worship of Almighty God adds nothing to his greatness; God needs nothing from us, and while we speak of "pleasing God" and "making God happy," no less than Saint Thomas Aquinas pointed out, in his Summa Theologica that God is, by his nature, cannot change or be changed. When we speak of God having emotions, we are really describing his unchanging will regarding that which is good or evil, as in good making God "happy" and evil making him "angry." So if worship does nothing for God, why do we worship? We worship because it is right that we do so; we are creatures, and creatures need to recognize and adore their Creator. We might ask, why is it necessary to stand with good posture? Because to stand with poor posture -- pushing our bones and muscles out of proper shape and form -- distorts us, and might ultimately cripple us. Just as our body needs proper form in order to function well, so creatures need to be in their proper "alignment" vis-a-vis both God, and all other creation. A: God made me to know Him, to love Him, and to serve Him in this world, and to be happy with Him forever in the next. So it is certainly true that God's aim for us may be expressed simply as, to make us happy--provided we understand "happiness" as being in right relationship with God, our world, and other people. Worship is essential to us being in right relationship with God and others. That said, the other comment I can't really do much to salvage: "Just do good for your own self. Do good because God wants you to be happy." Well, uh, yeah, sort of...but no. 2) As stewards of creation, God has given us a share in governing creation, which means our choices make a real difference in this world. We help make this world more like heaven, or more like hell. 3) People all around us are hungry, suffering injustice, lacking essentials, in need of companionship, healing and strength -- and God sends you and me to care for them. So...do good to others so that others may be blessed by God through you. Do good to others so that when the Lord calls all before his throne, you are numbered among the "sheep" of whom he says, "whatsoever you did for the least of my brethren, that you did unto me"--rather than the horrifying alternative. And theeeeen...it's true to say we "do good" so that we can "be happy" -- as in, happy in heaven, rather than roasting in hell. I was really looking forward to today. Yesterday, after the last Mass -- and baptism, which I'd forgotten about -- I was very tired. I went home and stretched out on the couch for several hours. In the evening, I went over to the picnic, and had dinner with some parishioners. After visiting, I went home again. I'm sorry, folks, I wasn't more involved. This morning, I slept late. That means, up around 8 or so. For breakfast, I put some of those Pillsbury rolls in the oven, then sat down to read the new online. Only I sat too long, and the rolls burnt! So I did it over again. I spent the morning reading, then in the early afternoon as I was getting ready to go over to church to offer Mass, I got a call: an older parishioner needed Last Rites. I was dressed casually, so I threw on my cassock, went over to church to get holy communion for the woman, and then drove over to her house. Two of her daughters and I prayed with her, and I did all I could. Then I drove back and had Holy Mass privately. I think someone walked in while I was offering Mass (I was at the high altar, facing the Lord, so I couldn't see); after Mass, I went back over to my house and fiddled around on the Internet; my other project was to go down and buy a TV. So I drove down to Piqua, only the store I was looking for wasn't where I thought it would be! After some driving around, I found it; I picked out a TV, plus a DVD/audio system to go with it, and then went to get something to eat. I just got back and have been reading some news. Some off-days I go to a movie; when it gets a little cooler, I hope to get out on my bike. But today, I just wanted to rest. For some reason, I haven't been sleeping as well as I'd like, and that's why I was tired. Meanwhile, I'm thinking about how grateful I am for the parishioners who have been pitching in to paint my house. It looks great! Thanks!